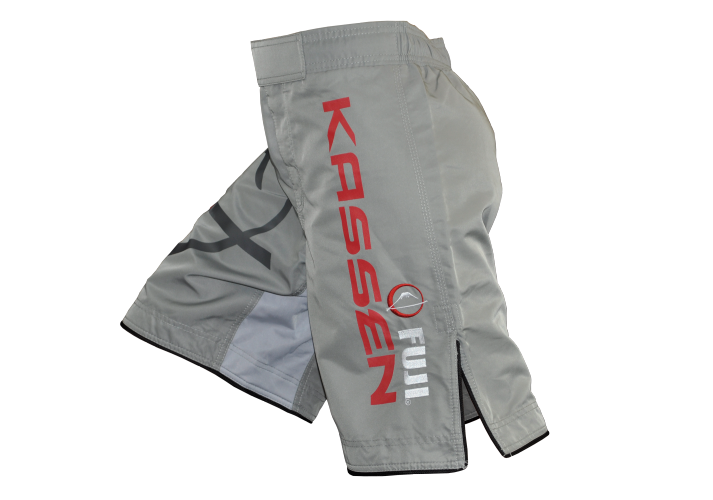 This article reviews the FUJI Kassen MMA Shorts. These shorts are designed for mixed martial arts (MMA) and submission grappling practitioners. The following content will describe this product and my personal experience using them for stand-up and grappling training. Physical Appearance: The Kassen shorts are currently available in the colors shown below. They have an attractive appearance that is not plain looking or have tacky images. The graphics present on these shorts consist of screened and embroidered logo and brand names. Fabric: FUJI constructed their Kassen shorts out of an antimicrobial fabric. Side Split Seams: The sides of the Kassen has split seams, which is one feature incorporated into its design that improves the range of motion achievable for the user. Inner Thigh and Groin Panels: The other feature of the shorts that maximize the range of motion attainable is the stretchy fabric that forms the short’s inner thigh and groin area. Velcro and Laces: For securing the shorts around your waist, the Kassen integrates a combination of Velcro pieces and laces. The following image shows these elements. I enjoy the comfortableness of the Kassen shorts. The fit and the security of the shorts around your waist is impressive with Kassen’s combination of a Velcro closure, elastic waistband and laces for adjusting its tightness. The combination of the split side seams and the stretchy fabric used for the inner thigh panels and groin area provides flexibility for the shorts. These features allow me to throw kicks without feeling too hindered or restricted on my range of motion. However, I wish the Kassen shorts’ length were a bit shorter. 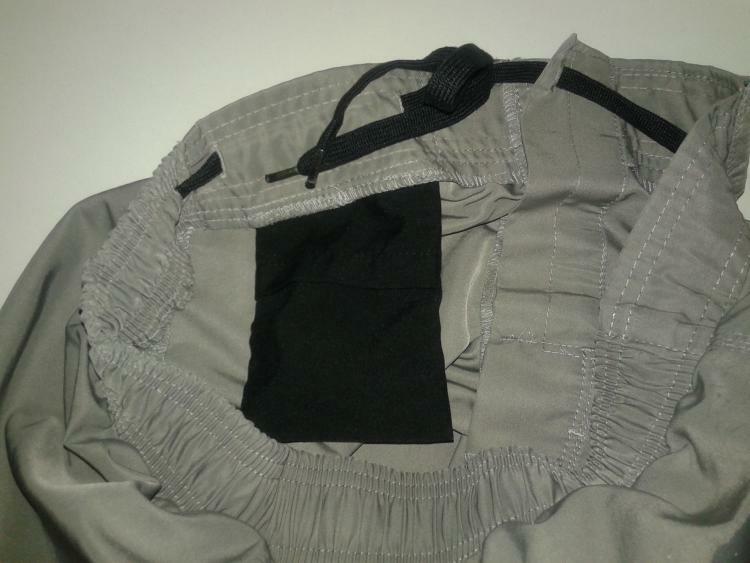 The interior of the shorts has a pocket for holding your mouth guard. This convenient design eliminates the need for me to run back to the locker room and rummage through my gym bag for a mouth guard as I switch between classes or activities. 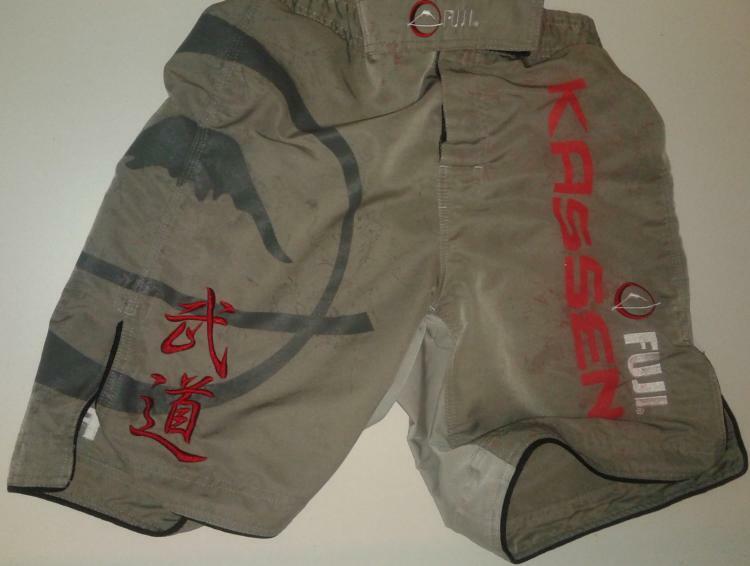 One of the negative aspects of the Kassen MMA shorts is its durability. Even though its fabric and embroidered graphic have demonstrated great durability, the same could not be said for the graphics screened onto the pants. The Kassen shorts must be washed delicately in the washing machine or hand wash. Ideally, they should be hang dry. 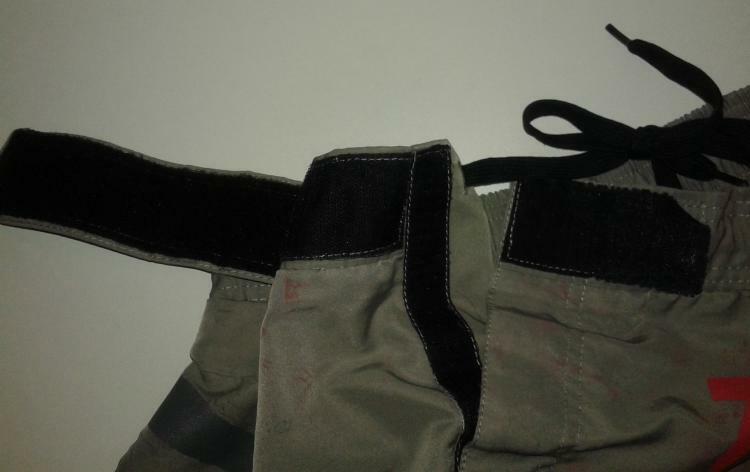 Otherwise, the dryer setting for these shorts must be set to “air dry.” The following image displays what happened when I continually wash and dry my Kassen MMA shorts with my regular clothes. Both the logo and the large word “Kassen” has bled out their colors. In addition to that, the adhesive portion of the logo is causing the shorts to stick to itself. This graphic break down problem could possibly have been avoided if FUJI had sublimated the graphic instead of screening it on. 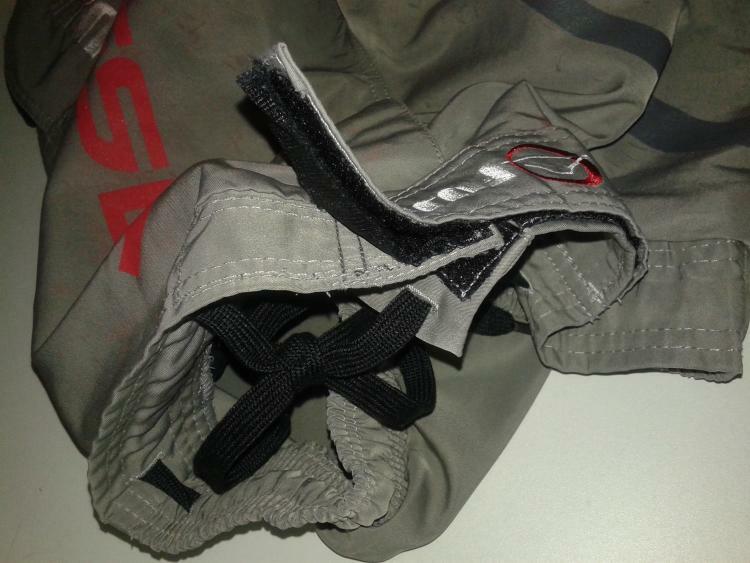 The other durability issue I came across involves my short’s velcro ripping away from its stitches. This damage is exhibited in the image below. Despite the durability issues mentioned previously, I still currently use the Kassen shorts for both striking and grappling training.